I've been playing Pokémon Platinum. 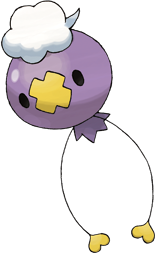 One of the pokémon is a ghost creature called Drifloon. It's supposed to be a balloon animal of some sort. Balloons were originally made to be instruments of science, where one could research weather patterns. It's still used to some extant but it's being phased out due to more efficient methods. Balloons have since been used for transportation, decoration, entertainment and even medicine. There are now even balloon art, which is a form of non-permanent sculpture. Balloons are made out of a number of materials ranging from rubber to polycholorprene. Balloons are popular with children, and is ubiquitous with celebrations. They do, however, pose many problems. Airborne balloons can easily become pollutants as the material they are made off are not easily degradable. They pose a danger to wildlife. For children, balloons are suitable only for a certain age range due to choking hazards.